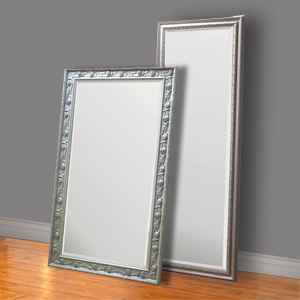 "Leaner" mirrors are a free standing mirror perfect for the serious bedroom or dressing room. Positioned vertically and leaning backwards against the wall, these magnificent mirrors provide just the right angle, allowing that so important full 'hat to shoes' view imperative for finalising any outfit. Making the best use of usable space and available light in even the most restricted of rooms, leaner mirrors are designed specifically to be free standing, allowing ready movement and re-positioning however and wherever you wish. With a choice of decorative or deeply embossed period design frames, hand finished in "Pavilion grey" or "French grey" paint from the heritage collection by Farrow and Ball. These magnificent mirrors make the perfect adornment to any room. Complete with a opulent bevelled edge mirrors, just adds that finishing aesthetic touch marrying mirror to frame. Available sizes are 1470 x 730 mm or 1870 x 590mm (4'10" x 2'5" and 6'2" x 2'0" in old money) both are in stock ready for immediate delivery. As our featured item here LC284 and LC285, there's a further 10% off the already discounted price listed on our site, but only for our newsletter readers using the code "LEANER10" at checkout. We'll even deliver it for free. A full length mirror provides much more than just a useful piece of furniture for looking at or enhancing light, it brings a classical finish to any room.